I am overjoyed that I had the opportunity to spend three days at Peace Love Yoga in Glassboro, painting mandalas on the walls as murals. Well, technically “mandala” is Sanskrit for “circle”, and I painted half a mandala on one wall, and just over one quarter of a mandala on another. The finished mural on the large wall. A mandala is a symbolic picture of the universe. It can be a painting on a wall or scroll, created in coloured sands on a table, or a visualisation in the mind of a very skilled adept. The mandala represents an imaginary palace that is contemplated during meditation. Each object in the palace has significance, representing an aspect of wisdom or reminding the meditator of a guiding principle. The mandala's purpose is to help transform ordinary minds into enlightened ones and to assist with healing. Below, you can get a look at the project at various points in the process. If you click on an image, it should embiggen for you so you can see it a bit better. And, of course, I am on fairly strict rest for the remainder of this week, because my joints were overtaxed (ladders, painting) and now require a bit of TLC. My wrists are both sporting braces, in fact, just to help them rest better and to ensure I don’t overdo things. It’s super hard to do too much when you can’t bend your wrists! I am in a perfectly good mood, despite the extra aches and twinges. How could I not be, when I spent so much time creating a large, happy mandala—twice? If you get a chance to take a yoga class at Peace Love Yoga, check out my work in Studio 1. 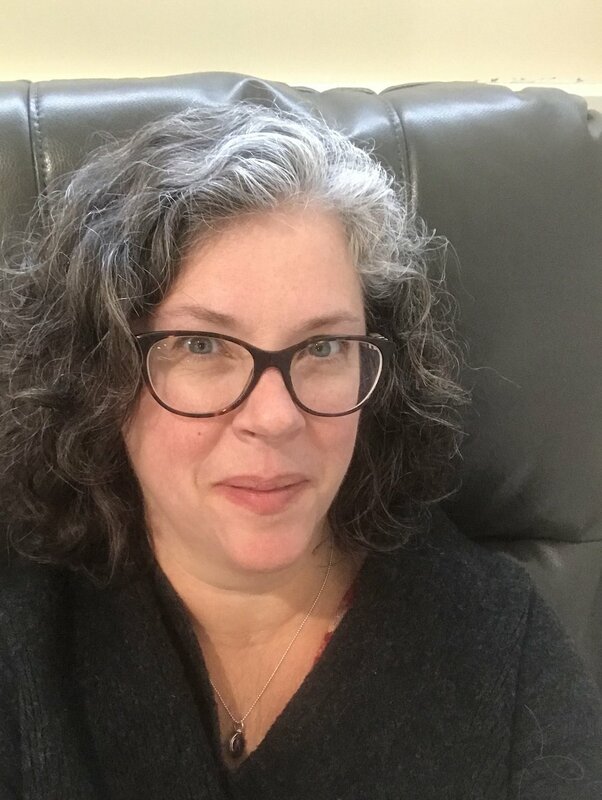 And if you are interested in receiving more behind-the-scenes information and in information about positive living, please subscribe to my (mostly) weekly newsletter! 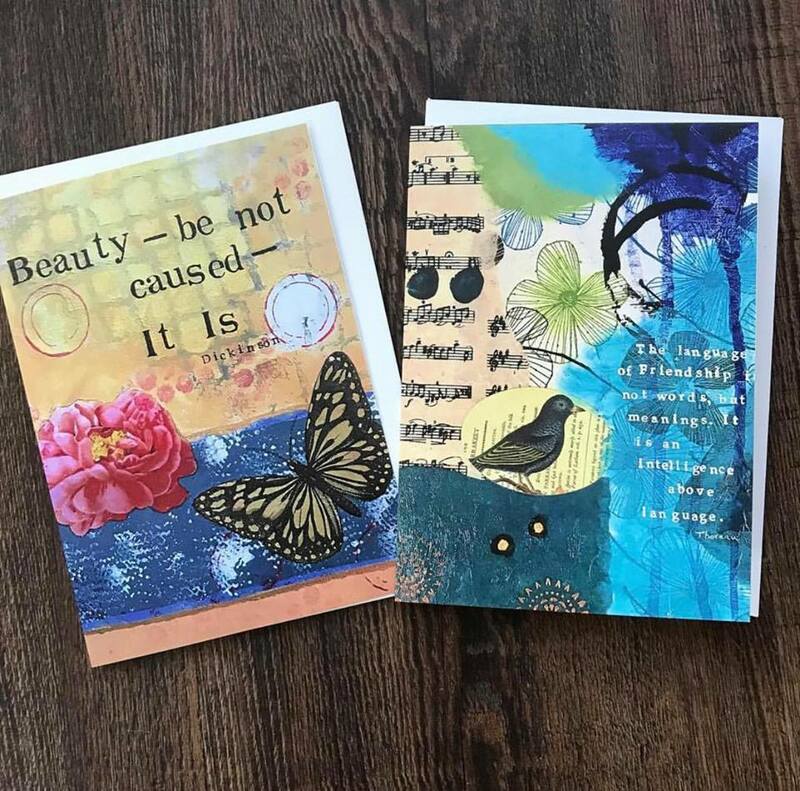 I am so excited to have several new card designs available for you! They are all made from my original artwork, as I’m sure you’ve come to expect, but I went and used a design program to add text to two of them. As tomorrow is my birthday, it’s fitting that one of the cards is quite specifically a birthday card. The other card with added text says “Thinking of You”, and is, I think, appropriate for the regular sort of thinking of you purposes, as well as being used as a sympathy card. As always, greeting cards are available in my web shop, and are priced $5 each, or 3 for $13.50. If you would like more than three, please get in touch. I’m happy to quote you a price and hook you up. Feel free to browse greeting cards here. 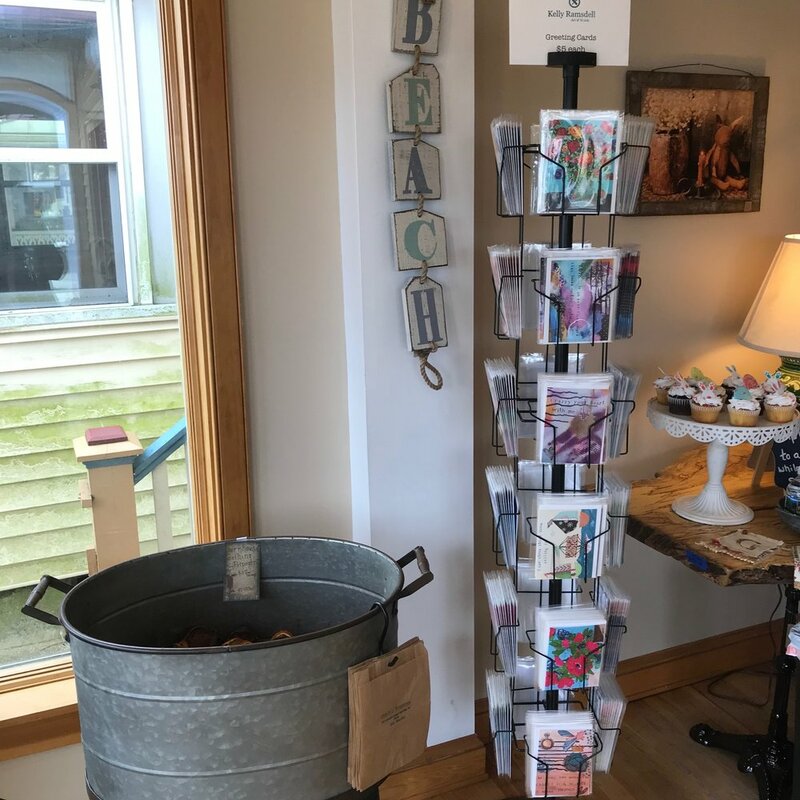 And starting next Saturday, April 13th, all 24 of my greeting card designs will be available for you to shop in person at Olde Pear Primitives, located at 523 Lafayette Street in Cape May, New Jersey! Earlier this week I took a short break from South Carolina and flew home to New Jersey, where I got to see my husband (YAY!) and my cat (YAY!) and have an IV for my rheumatoid arthritis (yay?) and take a quick trip to one of my favorite towns in my state, Cape May, to live out a bona fide business dream. And then! On Friday, Morris and I drove to Cape May. Specifically, to Olde Pear Primitives, which is fixing to open on Saturday, April 13th. Olde Pear Primitives is located at 523 Lafayette Street, right on the corner by the light (near the Acme and the bike rental place, if you know Cape May at all). It’s a cheerful, welcoming space, run by a cheerful, welcoming proprietor. See? 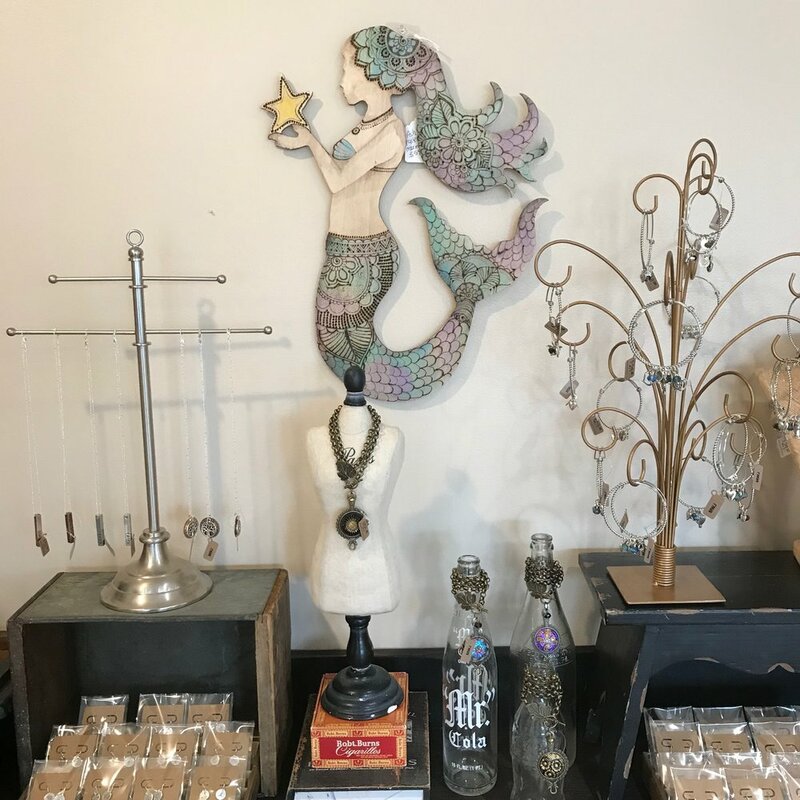 Below are some images of my work on display at Olde Pear Primitives © Genevieve of Olde Pear Primitives. Can I just share with you all how excited I am about having my work in a shop in Cape May? It’s literally a business dream come true for me. I will be selling my greeting cards (all 24 of them!) there, as well as tambourines, hot air balloon pieces, sailboat collage paintings, the small “Shine” piece you see above left, and some heart collages. You can find more about Olde Pear Primitives on their Facebook page, but the grand opening is on Saturday, April 6th! I am sorry that I’ll be missing it, but I will still be in South Carolina for a bit longer. I can’t wait to visit once it’s open, though! Not to jump on Marie Kondo’s train (although I bet it’s a really tide, neatly-folded train), but you can start by clearing some clutter. My personal policy is (and has been for the past seven years) to “get rid of everything that does not bring pleasure, beauty, or purpose into my life”. You can read six tips on how to clear clutter here. Clearing out the stuff that you no longer like, use, or want makes space for energy to circulate inside your space! You can read more about this idea in my post from October. Once you have taken out the trash, donated the stuff you no longer care to keep, and followed the other steps in my earlier post, you can start finding good ways and places in which to store your stuff. If your clothes all have homes in closets or drawers, then they won’t be strewn about your bedroom or home. It makes it simpler to find what you want when you want it, and it also reduces the amount of visual clutter in your life. If you get totally overwhelmed or are stumped with how to start in any given room, I always recommend clearing the top of the largest flat surface in the space—doing so gives your eyes a place to rest and makes the whole room look tidier in a hurry. Don’t believe me? Go into your dining room and make sure the table is cleared of stuff that doesn’t belong there (clothing, papers, crafts, shopping bags, etc.) Or go into a bedroom and clear anything that doesn’t belong on the bed off of it and make the bed. In your kitchen, clear off the island or (if you don’t have one) the longest stretch of counter space you have. Having a place in each room where your eyes can rest and not be driven wild by clutter will make you feel more relaxed and ready for spring. Take a walk in your yard or neighborhood, and keep an eye out for signs of spring. Count how many robins you spot, or look for whatever is just starting to bloom. For some of you, that might be azaleas or even roses, for others, it might be snowdrops. But look for signs of renewed life. Plant something. Doesn’t matter if it’s a full garden or a single plant or shrub. Spending time outside and digging in the garden (or cleaning it up) is valuable exercise, both physically and mentally. Do a quick maintenance and upgrade assessment of your yard and building(s). Are there things that need to be repaired or replaced? Do you need to get your gutters cleaned? Does your apartment door need sprucing up? Is your garden shed in need of a new roof or a lock on the door? What about your balcony or garden area? Do you need to buy or replace pots? Remove dead stuff? Plant something new? Spring is a great time for making a list of the projects you want to get to during the warmer weather. An easy way to celebrate spring is to brighten the corner where you are. (And yes, I realize there’s an old hymn by Ina D. Ogden of that name, and the pun or wordplay was intentional.) 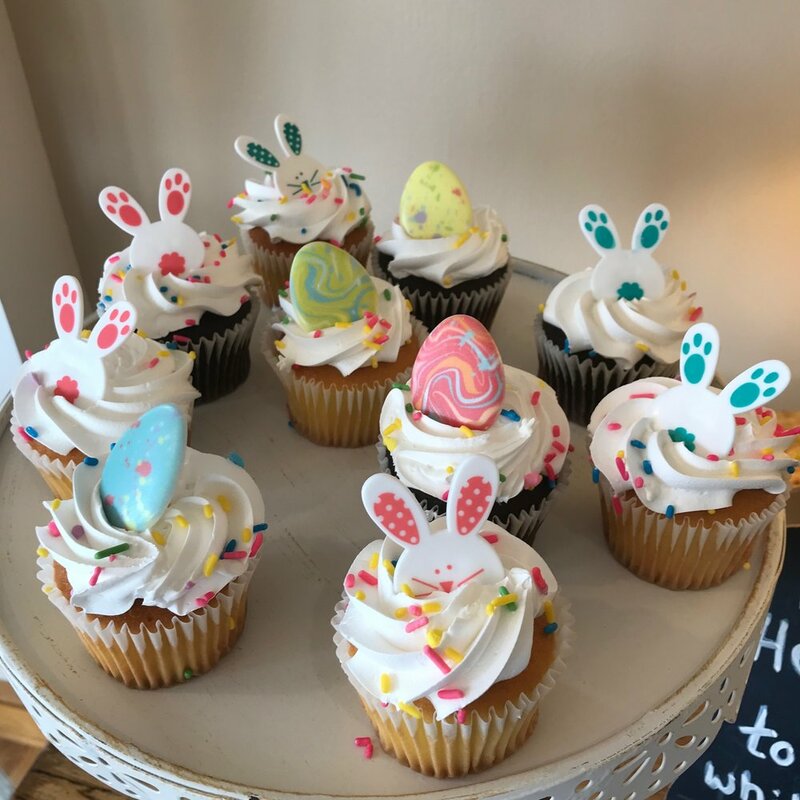 You don’t have to put ginormous bunny and egg clings on your windows (though of course you can, and if you have little kids, they may really like that); you can simply add some spring touches inside and outside your home. a cheerful garden flag, if that’s how you roll. 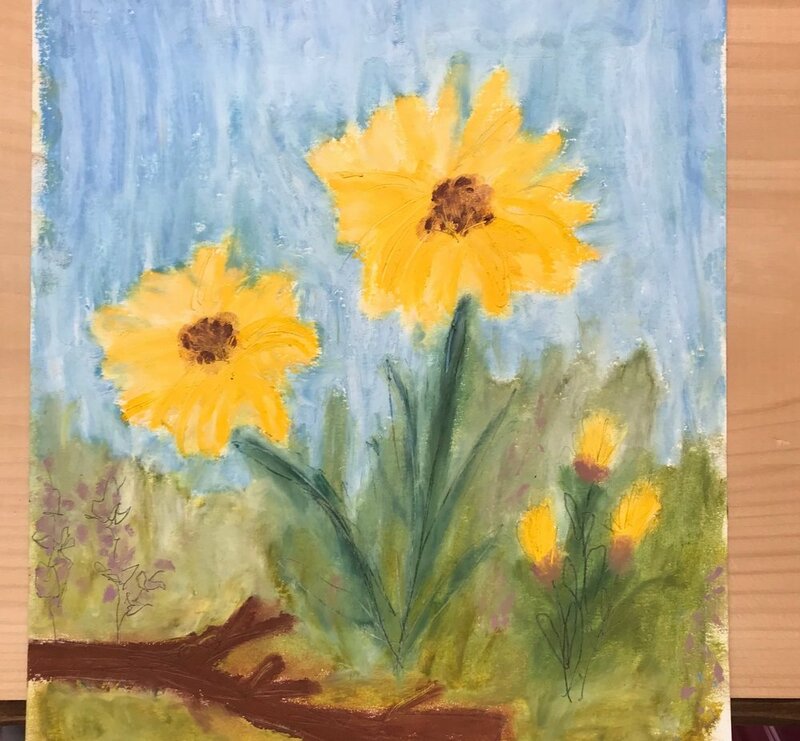 Could be spring-themed, or just something new and cheery. a new wreath or other decoration for your door; note: it doesn’t just have to be your front door. You can also perk up your door into your garage or laundry room or a side door, if that’s what you usually use to go in and out. 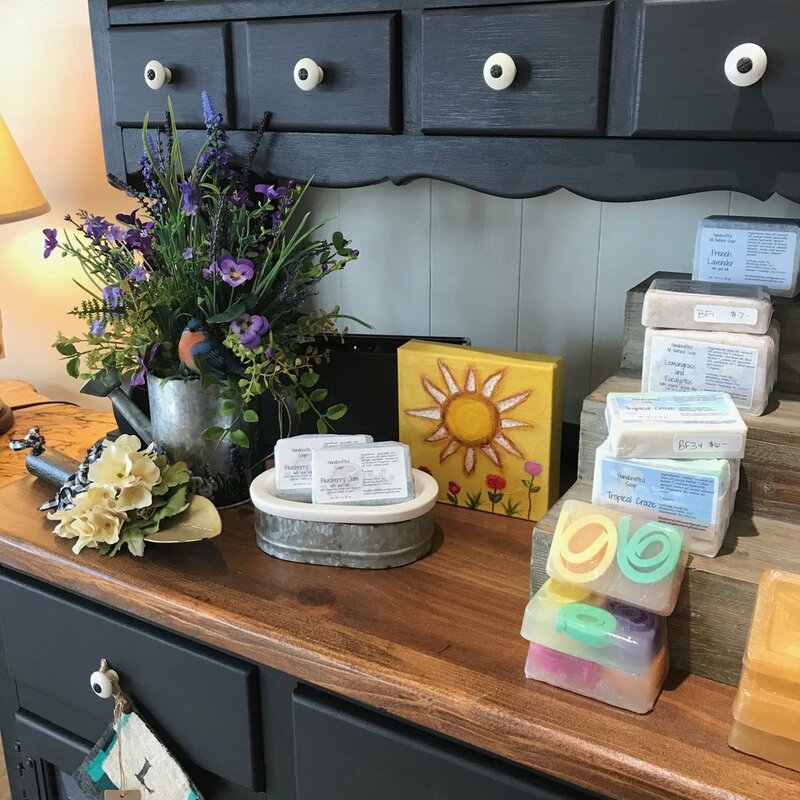 Once you’ve tidied up your front hall or foyer or sunporch, consider adding a seasonal touch; could be a small, cheerful birdhouse or a basket of eggs; could be a new piece of artwork to sit on a table or shelf, or hang on the wall to welcome your guests. Take a good look at the art and photographs in each room. Do you still like the item? Do you still like its frame? If the answer to either question is no, consider replacing what you don’t like. If the answer is yes, assess whether it needs a good dusting. Wipe the frame with a soft, dry cloth, starting at the top and working your way down the sides, finishing with the bottom. If the piece has glass over it, decide whether the glass needs cleaning. Do not spray any cleaner on the glass. Instead, lightly spray a microfiber cloth with water or an ammonia-based cleanser (if you prefer, though water usually works fine), and carefully clean the glass surface by rubbing gently in circles, then drying the glass with another section of microfiber cloth. You may want to take the art or photograph down from the wall and lay it flat to do this. And yes, I am now completely distracted from singing the Beatles song of that name. It’s such a syrupy song, but I still completely and totally love it. Everything’s coming up roses . . . The Grand Galleria at 405 S. Main Street in Williamstown, NJ, has several of my art tambourines in it. The Galleria is typically open when shows are on at the Grand Theatre. Mystic Ginger at 102 S. Black Horse Pike in Blackwood, NJ, has several of my art tambourines as well. Mystic Ginger is the coolest hybrid space: part salon, part herbalist, part sales gallery for local artists. Open Tuesday through Saturday, hours vary. Their website is here. 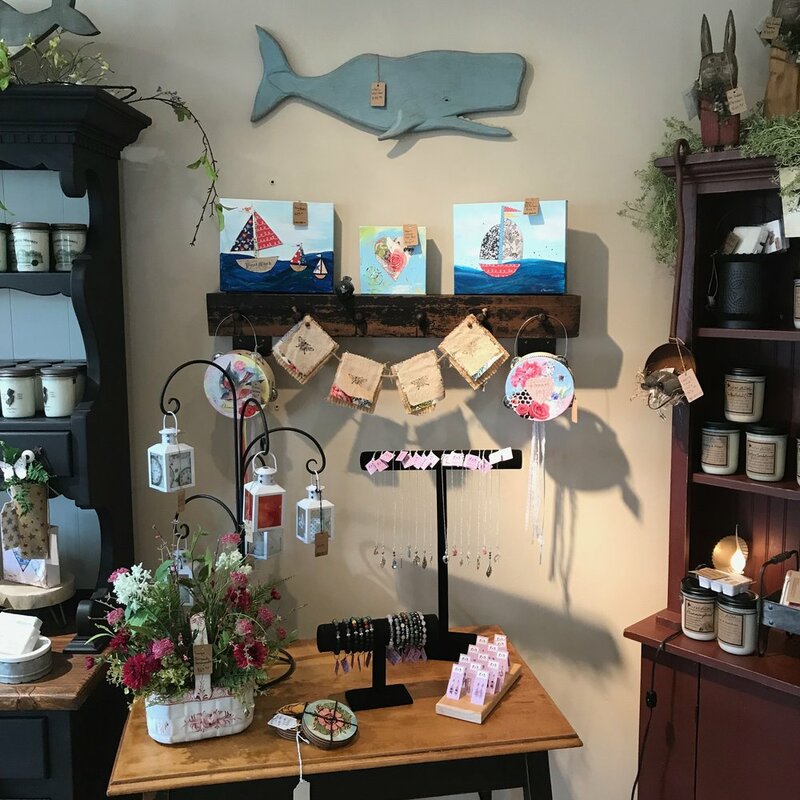 Olde Pear Primitives at 523 Lafayette St. in Cape May, NJ, opens on April 6th. 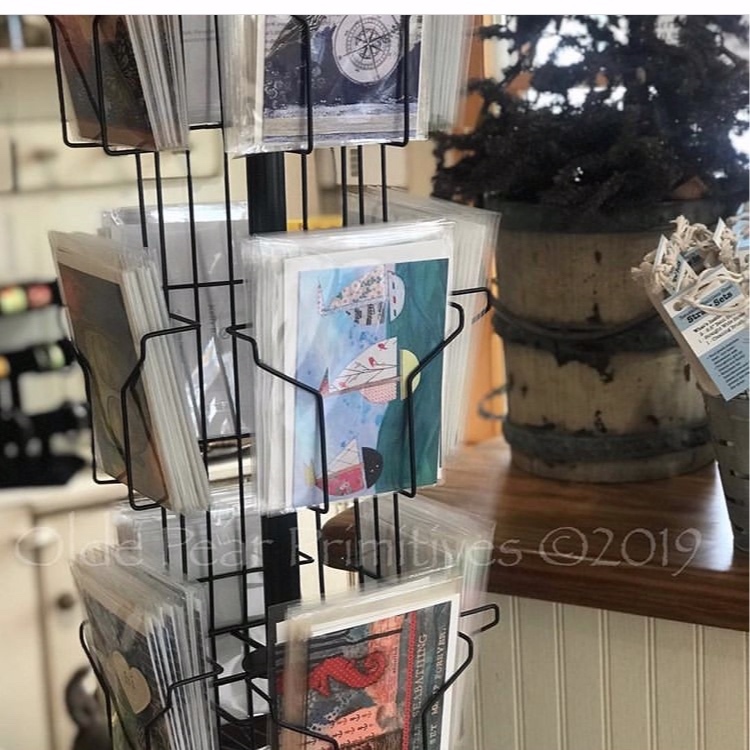 You will find my complete line of greeting cards, as well as some original art pieces, for sale when the new store space opens in a few weeks! Find them on FB, or at their website. 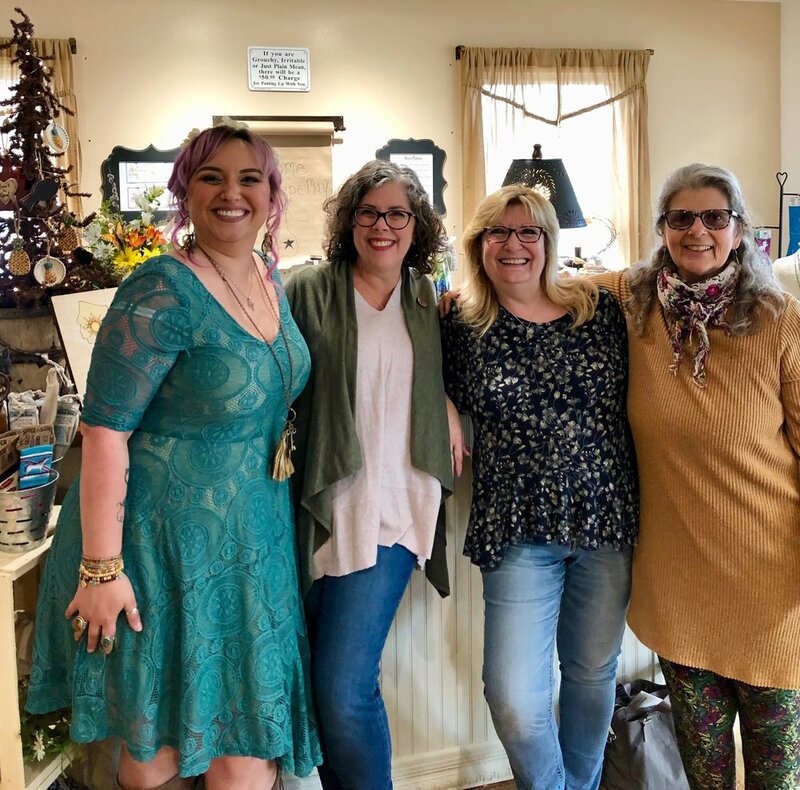 MADE Artisan Marketplace, 65 N. Broad St., Woodbury, NJ. MADE is currently in the process of renovating and moving into the building once owned by Franklin Davenport, who was Benjamin Franklin’s nephew. The mixed-use space will have gallery space, maker spaces, and selling spaces, plus an attached espresso bar. It’s gonna be cool! And likely will open near the end of April. More info to come, both here and on MADE’s website. Where is an internet business if not everywhere? 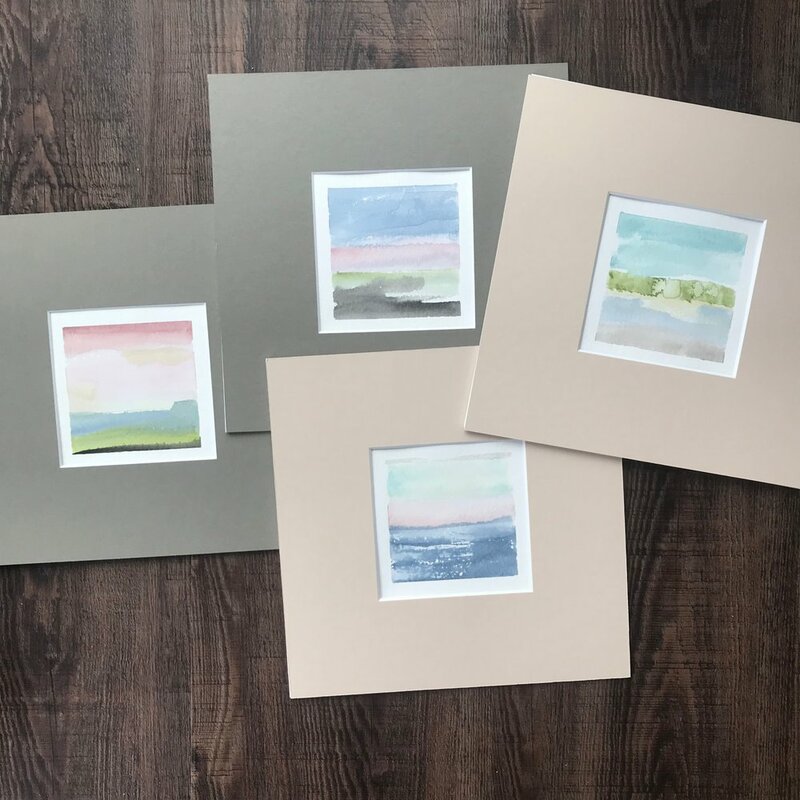 You can always shop for greeting cards, art tambourines, original literary collages, and paintings of various and sundry sorts on my website. Just pick your category from the top of the home page! And hey, while you’re at my home page, why not sign up for my email newsletter? It gets you info on what’s up, when, and passes along lots of tips and info on living life in a positive manner. Because we all want “to lead a better life”, as McCartney wrote and sang to open the song that loaned its title to this blog post. You can see some of my greeting cards here. It’s a slideshow, so click to swipe! You guys. Exciting things are happening for my art business. Like, REALLY exciting things. 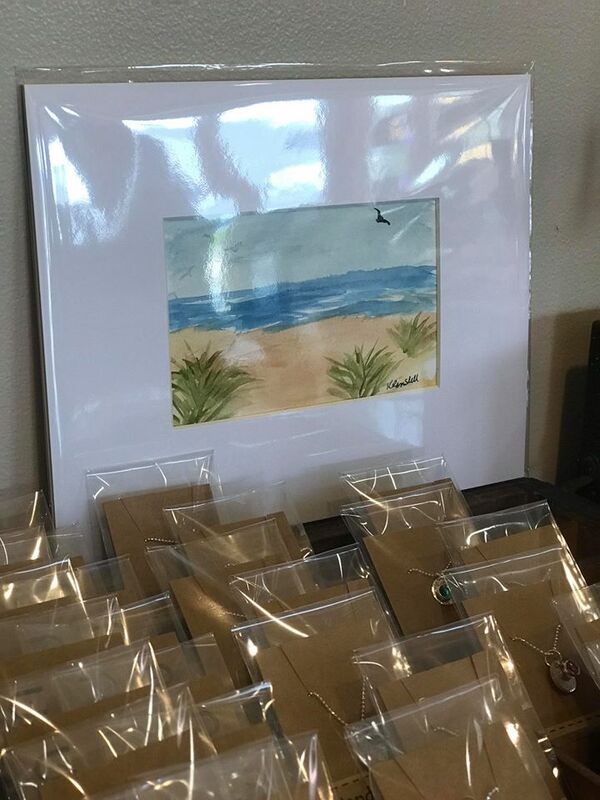 In just a few weeks' time, you will be able to purchase my greeting cards and some of my original artwork at the new location of Olde Pear Primitives in Cape May, New Jersey. To say that I'm excited is a complete understatement. Seriously. 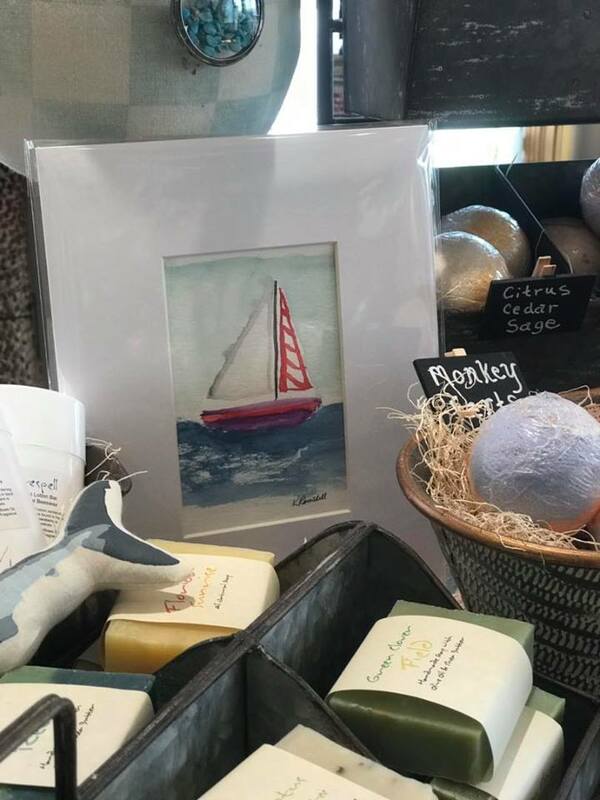 To have my work in Cape May, and at a business that supports local artists, is one of those "someday" business dreams of mine coming true. More info to come, but in the meantime, ALL THE CONFETTI! Right now I’m in South Carolina while my dad recovers from surgery—an esophagectomy, to remove his esophagus and any remaining cancer cells in or near it. I got here last Wednesday evening, and have managed to create exactly one piece so far. Considering that we spent all day Friday at the hospital, and lots of time every day since then there as well, I consider this a victory of sorts. 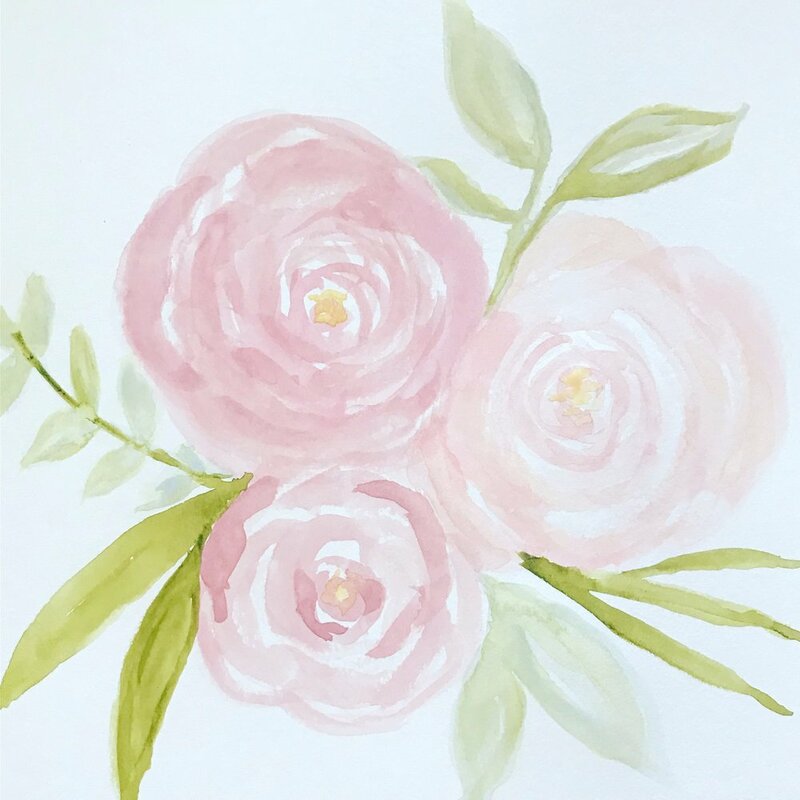 This bouquet is made using oil pastels on watercolor paper. Oh! 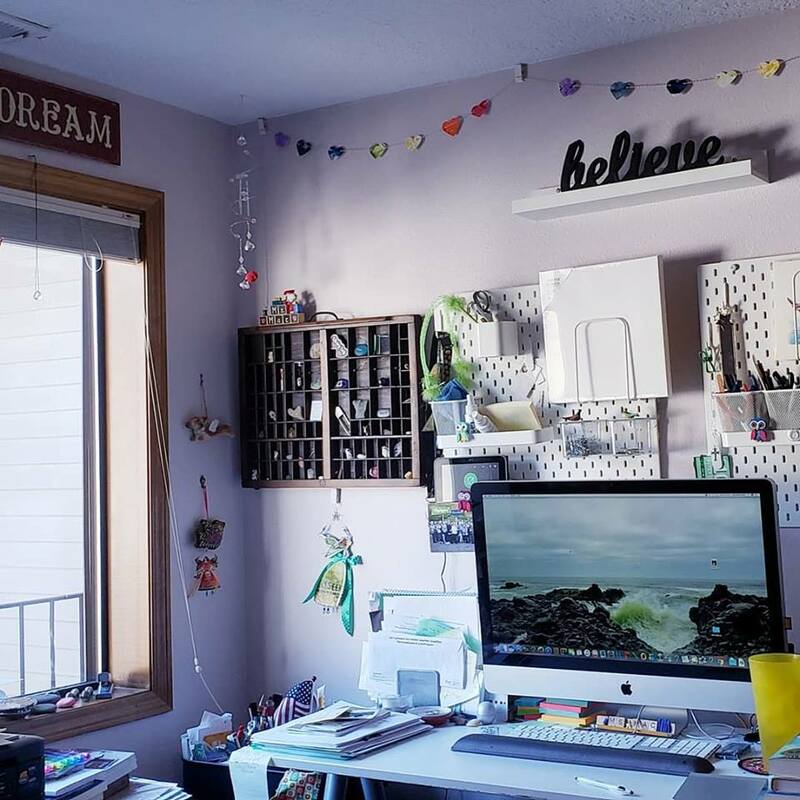 And one of my friends who purchased chakra heart garlands shared a photo showing them hanging in her workspace, and how great are these? My sweetheart reminded me that I still have some of those chakra heart garlands at home. They are hand-punched from handpainted papers, and strung on red and white baker’s twine. Each string is approximately six feet long, and carries 14 hearts (each of the chakra colors, twice). They were created with lots of positive energy and an intention of helping to balance your chakras. If interested, they are $8 each or two for $15, and can be ordered here. 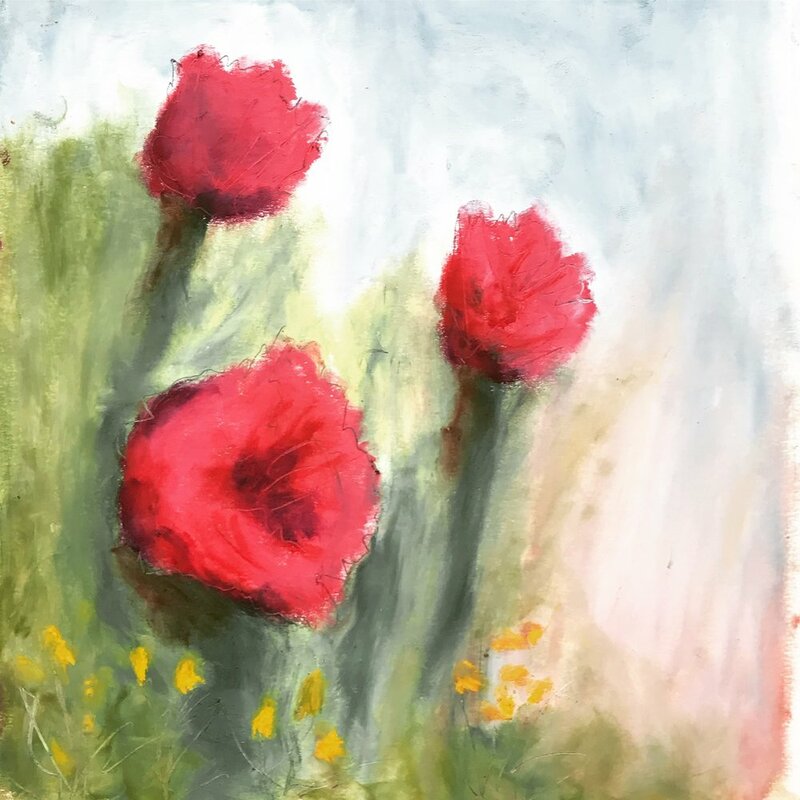 Original oil pastel on cold-pressed watercolor paper. At present, I’m in South Carolina to spend some time with my parents, since my dad is having cancer-related surgery, and their spring is so much farther along. The forsythia is almost done, the azaleas are starting, pollen is everywhere, and it’s glorious. If I’m a bit less present here, though, you will know why. 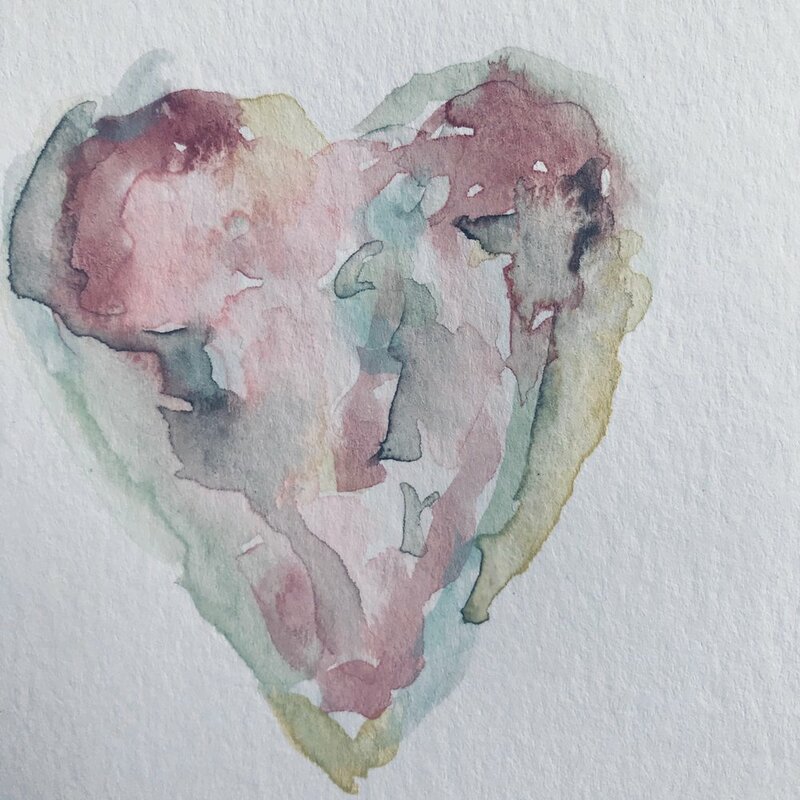 A super quick blog post to share the love with all of you, and to let you know that I will be posting a more detailed update about the many things I have to share soon. But for now, just know that you are loved. Oh. And I’m about to send out an epic newsletter, so if you’d like in on that, you can subscribe here: SIGN UP. 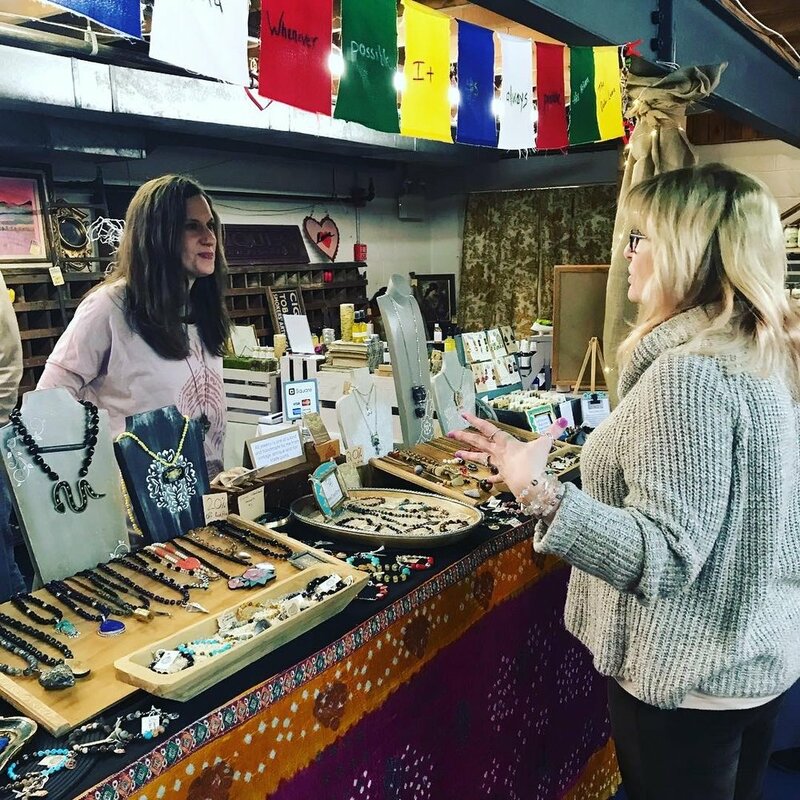 It’s a Valentine’s Pop-Up Market! 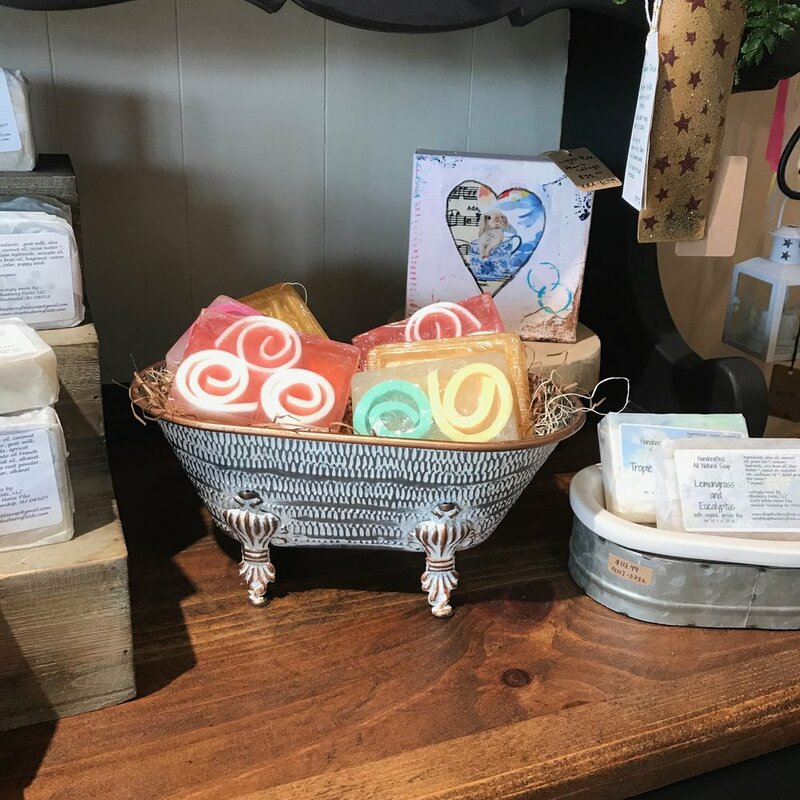 Creek Mercantile is located in Rancocas Woods. I am super excited to be attending this wonderful event, which will take place in the newly opened downstairs space at Creek Mercantile. Here is who else will be there: Relics Revisited, Mystical Blossoms, Creatively Obsessed, Henna by Ash, Evelyn Taylor Designs, Proud Mary Designs, Dorothy Claire, Le Petit Fox Knits, Works of Hope, Clove & Cedar, Canary Works, Willow Moon Candles, Sage Woodworks, Loriginals, Lisa Mark’s Designs, Studio 42 Jewelry, Karen Hoffman, and Hunny House Market. It’s going to be a terrific day—sunny outside, warm and friendly inside. YOU SHOULD COME!